"Stop the shams, stop the lies, we are fighting for our lives," constituents shouted Thursday, soliciting honks from drivers in support of the ACA. Ileana Ros-Lehtinen was among the 20 Republicans who crossed party lines to protect the ACA, while Mario Diaz-Balart and Carlos Curbelo, voted to pass the GOP replacement, the American Healthcare Act. “Stop the shams, stop the lies, we are fighting for our lives,” chanted a group of activists and constituents outside Carlos Curbelo’s southwest Miami-Dade office on Bird Rd. Wednesday, shortly before the vote. Publicly, at least, both Curbelo and Diaz-Balart were undecided until the last minute. The House is about to vote. Here's my final guess. “If Curbelo votes in favor of this bill, it will be a betrayal to the people in this community,” said Lorenzo Canizares, who lives in Curbelo’s district. Canizares said he’d never been a supporter of Curbelo, but appreciated his reputation for independence on issues like climate change. Now, he says he plans to work tirelessly to unseat Curbelo, saying progressives in the district see healthcare as the most important electoral issue in 2018. Together, this trio of Cuban South Florida Republicans represent districts that voted overwhelmingly for Hillary Clinton in 2016, and which have higher rates of new healthcare coverage under the ACA than almost anywhere in the country. 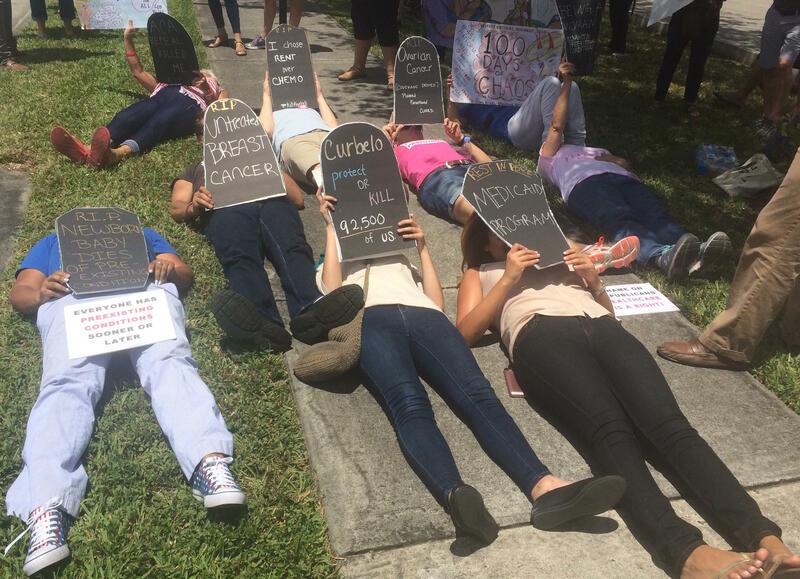 Victoria Rivera carried a cardboard tombstone marked “Curbelo: Protect or Kill 92,500 of US,” in reference to a report from the Center for American Progress which estimates that nearly 100,000 people in his district have gained coverage under the ACA. Fully 300,000—almost half the population in Curbelo’s congressional district, according to the report, have pre-existing conditions that could put them at risk of losing coverage if the ACA is repealed. “I became a pre-existing condition on October 29, 2016 in a matter of one minute” says Gisela Gomar-Salzverg, 59, when a bad fall left her with a concussion and internal bleeding in her brain. “I just started to drive, and to function like a normal person,” she says. 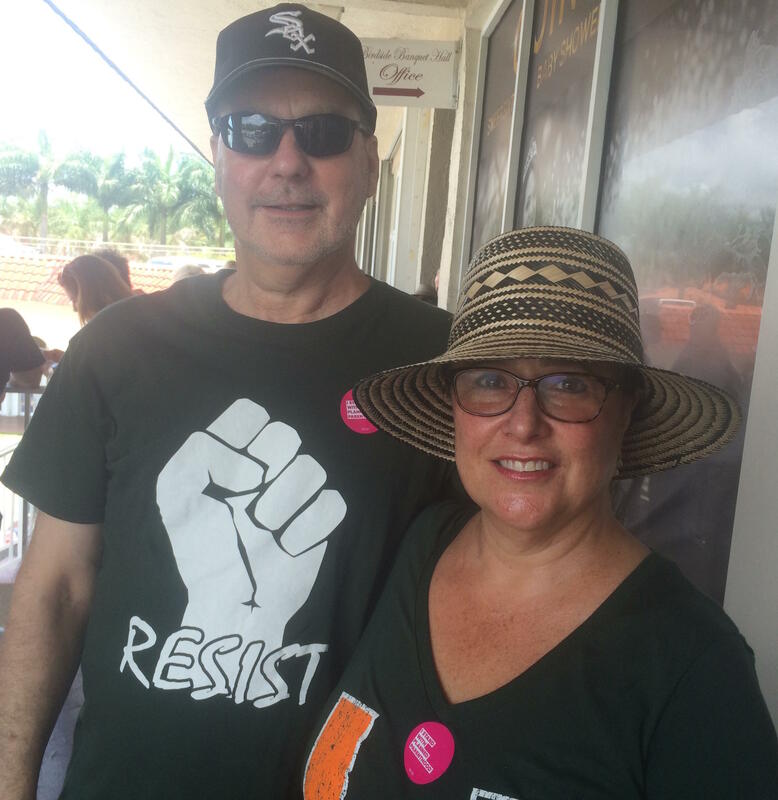 Gomar-Salzverg, a Cuban American and a lifelong Republican, lives in neighboring Ileana Ros-Lehtinen’s district, and says she could not fathom how Curbelo and Diaz-Balart could be persuaded to support a bill that could strip benefits from so many of their constituents. The bill now moves to the Senate, where major revisions are expected before it can come close to passage. Even if the AHCA doesn’t become law, Gomar-Salzverg says Curbelo and Diaz-Balart will have a steep price to pay for supporting it. “Was there a formal appointment scheduled?” asked the congressional aide who opened the door at congresswoman Ileana Ros-Lehtinen’s Miami field office Tuesday.